Riding in on the first day of spring, Bootie NYC returns to Manhattan for a very special night of mashups to pull you out of the winter doldrums and get you ready for the brighter days ahead! 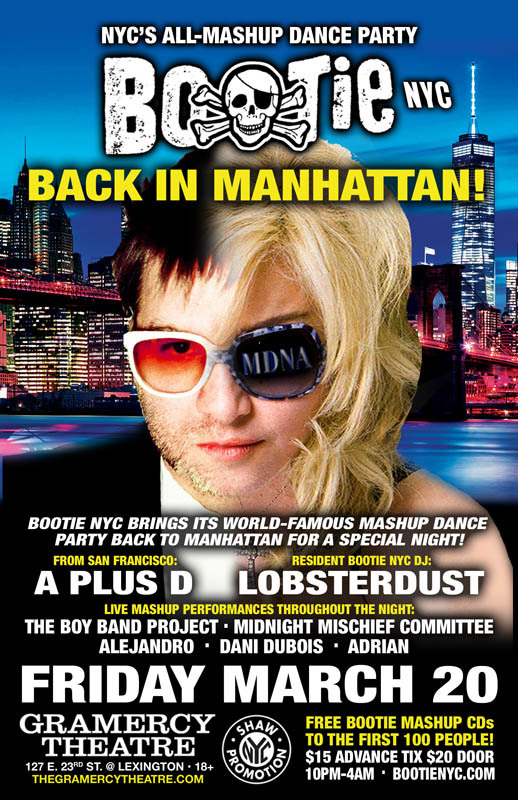 Taking over the Gramercy Theatre, one of the best mid-sized venues in the city, will be Bootie founders and DJs A Plus D – coming direct from San Francisco – along with Bootie NYC’s very own Lobsterdust. Together, they’ll be spinning the best mashups in the world and giving you a reason to dance all night! At 1 AM, Bootie channels some ’90s boy band realness, as The Boy Band Project takes the stage to mash up Backstreet Boys with N*Sync! Sideshow circus act The Midnight Mischief Committee will attempt a classic Houdini escape for your maniacally mashed up pleasure! And live singers Adrian, Alejandro, and Dani Dubois will be rockin’ the stage with live mashup performances throughout the night! All this, plus FREE Bootie mashup CDs to the first 100 people through the door!